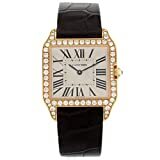 Women’s Watches – Beautiful watches at discounted price! When it comes to buying the right watch, shopping around department stores for the right fit can be both tiring and time consuming, and often leaves you without purchasing a watch. This article is here to help you, listing five amazing offers on women’s watches you can find on our website. These watches are all highly rated, and listed in no particular order. Enjoy this list that we have composed below. This watch is not only fun and colourful, it also has great reviews with 4 and a half stars. This women’s Swatch GS124 watch has both a plastic case and a multi-colour dial. Swatch created watches are always carefully crafted and they include a precision Quartz Movement. This watch has a 2 year guarantee.